Nearly everyone has heard of the strategy of approaching homeowners in mortgage foreclosure, and trying to do a deal. In fact, it’s been a well-known stategy for decades. I suggest you take the same strategy and apply it to tax sale pre-foreclosures. The benefits of tax sale properties vs. mortgage pre-foreclosures are numerous. While everyone knows about mortgage pre-foreclosure investing, few seem to have caught on to applying the same strategy to tax foreclosures. Developing a “list” of properties facing tax foreclosure is a bit different than compiling a similar mortgage foreclosure list. Such mortgage foreclosure lists are often even available for convenient pickup at the county once per month. To compile a tax pre-foreclosure list, past sale results often must be obtained (tax lien states), and then cross-referenced to a list of owners who have since paid their taxes. 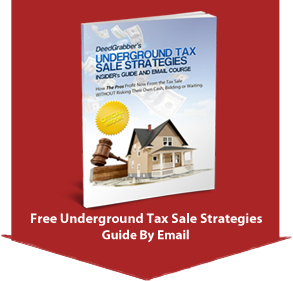 Or, owner names and addresses must be developed from a tax deed sale list. This can require a little extra effort, but it’s well worth it to be the only investor pursuing a group of properties. More importantly, tax sale properties are far, far likelier to have equity. It goes without saying that all properties in mortgage foreclosure have a mortgage – and with the downturn in the market, this mortgage is almost certainly higher than property value. Even if it isn’t, the mortgage amount is usually significant and must be paid off (or at minimum, payments must be maintained). The amount required just to stop the foreclosure often exceeds $20,000. Tax sale properties are usually mortgage-free. This is because mortgage companies stop the tax sale process for any properties they have mortgages against (otherwise, their mortgage is threatened). Therefore, the properties remaining unpaid at the end of the process are the ones with no mortgage company to step in and pay the taxes. In addition, the amount needed to redeem tax sale properties is usually less than even the amount needed to stop a mortgage foreclosure. But then there’s no mortgage to deal with! Generally, properties (with equity) in mortgage foreclosure have a high rate of owner-occupants. If the property has equity, it usually indicates that the owner has been paying on their mortgage for a very long time – perhaps 20 years or more. Such an owner is likely attached to their home and unwilling to allow for you to profit without a fight. Tax sale properties seem to be the properties that have fallen through the cracks. After all, why else would a free and clear property be lost for just taxes owed? Usually, some kind of inheritance situation is involved, though the reasons for this to occur are many. Whatever the reason for this rare situation to occur, it does nevertheless. The property involved is usually vacant, or occupied by someone other than a hard-working, responsible owner-occupant. This makes dealmaking easier because the intense emotions of the mortgage pre-foreclosure owner occupant, are usually absent. A side benefit of dealing with tax delinquent properties, is that most or all information regarding the taxes is public information, and can be obtained any time. In contrast, the mortgage company is in control of a mortgage foreclosure, and cannot provide financial details that could be very important to us without the borrowers permission. This makes it difficult to properly determine which properties are the best to pursue. Also, tax obligations tend to have “hard deadlines” with no extensions possible. Banks, on the other hand, may allow numerous extensions and other delays for the homeowner, without us knowing until the last minute. Again, this makes it hard to prioritize which property owners we want to concentrate on. Mortgage pre-foreclosure investing had its day – when most investors didn’t know about it and when property values were rising. For today’s market, just go where the equity is – tax pre-foreclosures! I am l0oking at a property now. the owners died 10 years ago. after doing some leg work. I ask who was paying the taxes, no one, the city had comdeem to property. by asking the right ? ?s the property has been given to an attorney to sell for back taxes. needs about $40k to repair. Sounds like a messy one – I’ve learned to stick to simpler deals when possible unless the payout is very high. Watching one now. Owner died in the house. Has a reverse mortgage on it. Owner was also a hoarded. Sad part no relative has stepped forward to claim the property. State has to evict a dead man. A judge has them jumping thru hoops before he will sign off. When I see the constable place all his things on the curb. I will make my offer to the lender. Can’t sell with that smell. Has to go back to the studs. They most likely will sell cheap. Cut their losses and move on. Rehab cost high return very worth it. I want to know how to buy a tax property empty. I have paid deliquent taxes on two properties (unoccupied land) in Florida. So, what rights do I have as lien holder relative to getting deeds to the properties? What process can be employed to aquire said deeds? I hope you bought these at a tax lien sale. You have to do the proper noticing, and you will not get the property, it will be offered at a tax deed sale with open bidding. These funds will generate the moneys needed to pay you lien with interest. The only way you get the property is if nobody bids on it.